Happy New Year from Art+Village+City in the Pearl River Delta! Students paired up to create videos of places related to China and the Chinese diaspora throughout the Bay Area. 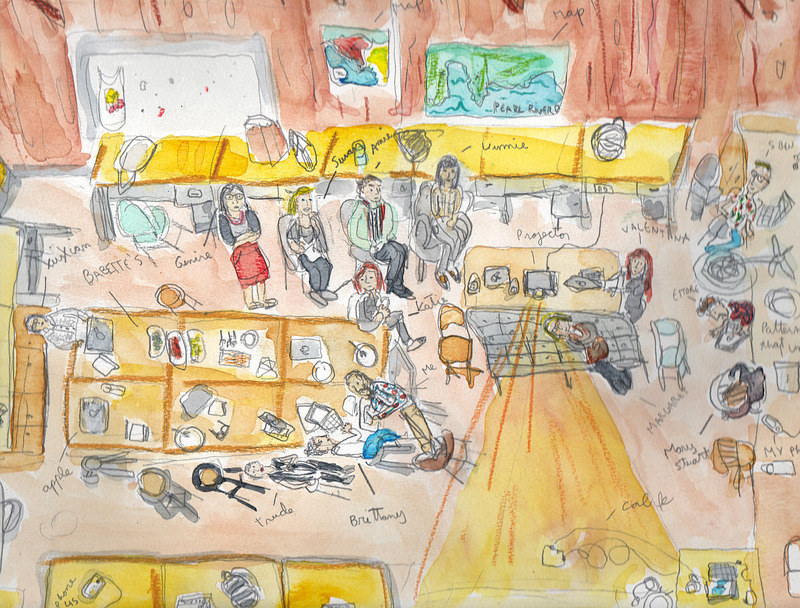 Here is José Figueroa's watercolor documentation of the in-class presentations! We'll be posting one of the videos soon, just in time for the New Year! Flynn’s talk raised the question of urban knowing and related it to the literary and filmic representations of the city and megacity. They are highly impressionistic pastiches on a journey through the language of the imagination. One could describe them as wonderful, unconventional and occasionally fantastic concoctions of psychological states, physical states, sensory states, transcendence, and more. Music, literature, Ireland, Dublin, Paris, friendship, woman, prostitution, diet, the influence of gaslight or the light of arc and glowlamps on the growth of adjoining paraheliotropic trees, exposed corporation emergency dustbuckets, the Roman catholic church, ecclesiastical celibacy, the Irish nation, jesuit education, careers, the study of medicine, the past day, the maleficent influence of the presabbath, Stephen's collapse. Some of the details captured in such prose are normally lost in the visual language of maps, technical drawings and illustrations. They are also invisible in the empirical descriptions and accounts of places. And yet, they seemingly carry a lot of weight in informing the sense of a place. They describe each city (on varying scales) by focusing beyond the dominant characteristics of its geographical situation and tangible built environment, highlighting instead more subtle matters like social practices. From my point of view as an architect and planner in training, such a skill is not only essential in windshield and walking surveys to understand specific aspects of a community or city, but also to demonstrate a future vision for the same. Although this form of description would require some development and adaptation, it would provide an insight into the aspirations of the proposed designs, something rarely “felt” in the master plans, policies and manifestos written in a mixture of academese and legalese. Yasir Hameed is a candidate for the Master of City Planning degree at UC Berkeley.